My relationship with water has changed a lot over the years. It started with that cozy, warm, happy feeling instilled by childhood baths with lots of foam and those nice colorful toys that keep you company in the tub that seems big like a whole lake to a little child. Then it was transformed into an immense joy brought on by some special spark only summer at the seaside can start, especially for those born relatively far away from the seas, lakes and oceans like myself. This harmony lasted for quite a long time, until I had my first panic attack in water, somewhat far from the coast which made all that agonizing swimming back in panic one of the hardest things I’ve ever done as I was convinced I would drown. It’s needless to say that since that moment I never ever swam further away from the last place where I could still touch the bottom with my feet, even though I used to swim really well. As the time passed, I learnt that there was another much darker face to my teenage summer seaside joy, the one embodied in pain, frustration, sadness and even shame when you get totally deprived of it by the willpower of your own nerves, just like in one famous curse which goes more or less like this – “May you first have everything, and then nothing.” We can agree that going to the seaside can be a too long trip for only partially recovered agoraphobic, but I live in the capital of Serbia that lies on two large rivers, the Danube and the Sava, yet for quite a long time I haven’t set my eyes on them at all. As my condition grew worse, I developed a fear of bridges. More precisely I think, of being trapped on a bridge. Or even more precisely, of not being able to get back to the other side of the bridge fast enough to reach the comfort zone. It’s not about heights, surprisingly I don’t have that fear. It’s not about water either because I never really think that I could end up down there falling of the bridge. It’s about the delay of “teletransportation” to my “safe place”, no matter how ridiculous that may sound to someone who never experienced it. I just need to get back home in no time, and bridges can mess badly with this. Agoraphobia brought also some undefined fear of staying for too long in the bathroom, which turned the joy of a long bath into pure hell, so as of now I think I could say that I’m on not very good terms with water in general. Nevertheless, I never had any particular problem with rain. Rain means umbrellas, bad weather, traffic delays, mud, wet feet, bad mood for most of the people. For an anxiety sufferer, that long, boring, slow and never ending autumn rain can ironically have an element of pure relief, because it calms your nerves, makes you slower and sleepy, almost sedated. It sorts of evens out the storm within you, taking you more towards the state where you should normally be. All of a sudden, rain got a whole new meaning. It’s been 3 days that it unleashes all its devastating anger on my small, already badly devastated country. It’s not a simple rain, it’s something like a constant 24 hour downpour and there is no way to switch it off or anything to tame it with. They say that we haven’t had such rains in 120 years, or to be more precise, ever since we started measuring the quantity of rain per square meter this has never been recorded. What should have fallen in entire 4 months landed in only 3 days, turning some nice Serbian towns in horrific looking fields of mud covered with many meters of rain. It’s not normal anywhere in Europe, let alone on Balkans and in Serbia. Rain started meaning trap. There is some primordial fear of that moist that sneaks into your clothes, shoes, skin, into houses, cellars, yards, into everything people have ever had or know, moist that can ultimately in the worst case scenarios even end somebody’s life. Here in Belgrade it entered our big apartment building cellars and formed quite large ponds in the suburbs, but I don’t think that we have even remotely become aware of how heavy the situation was and how much tragic it turned out to be for some people elsewhere in Serbia until we saw the news. Even when the water was 1 meter high, some people still hoped they could stay in their villages and protect their homes. When it went up to 3 meters, cries for help were incessant. Right now, there are places where water is more than 7 meters high. The center of some smaller towns resembles Venetian canals, you need boats to move along what once used to be streets. There is no safe water or electricity there, people are getting evacuated, and some of those areas are turning into ghost towns. There are wonderful people who gather humanitarian aid and give everything to help others in trouble, but there are also those who make money on the misery of others and sell bread, water and milk at prices five times higher than normal. There are both an angel and a devil in human soul, it’s always been like that and always will be. I’m personally not in any danger right now, but I don’t like how I feel. I feel immense uncertainty and fear. When you have PD, it’s as if all your emotions have been turned to the loudest of the volumes and it seems that someone has broken the volume knob, because there is no way to turn that horrible noise down. Empathy is heightened to the point when you almost literally feel other people’s pain, as if you had no steady emotional life of your own, as if you had simply turned into a mirror of emotions you’re bombarded with from the world around you. I wonder where those poor people will go. There are shelters for the night, two, three and that’s fine. What about later, when adrenalin goes down and when it’s not going to be enough to have only that dear life saved? Maybe you can start from the beginning with only your naked skin at your disposal when you’re young, but how about those who physically and mentally can’t do that any more? We’ve been in bad economic crisis even before, what’s going to happen now? 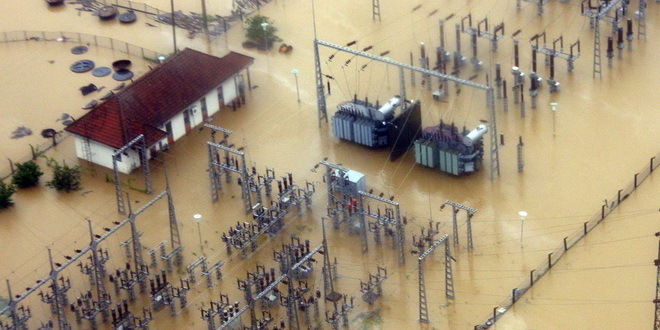 They also say that if water goes up only let’s say 30 cm more near some important electric plants, there will be power outages for the whole country for sure. That resonates 1999’s bombing power outages. Once we were without electricity for 4 days and nights without break. There is a lot that you can survive, there is no question about it, but for how long and how many times? Where is that cracking point, the ultimate limit? Rain dissolves mud, all sorts of waste and sewage and it threatens to contaminate all our water sources, and even though they say Belgrade’s water is still safe, will it stay safe? “Normal” people started panicking. I’ve been out today for 3-4 times in my neighborhood and I watched people passing by, carrying tons of water in bottles in their hands. I could almost start laughing out loud. Presumably they are the ones who are not afraid of anything, they live normal lives, and now some remote threat of water going bad makes them make supplies for the months to come, depriving that way of bottled water those who really need it, people in completely flooded towns. It’s selfish self-preservation at work, nothing to do about it. You can tell them that boiled water is still great water, but they will buy whatever they can find, as though some really limited quantity of water can save their lives. The problem is, if the rain makes it up to 7 meters high even here, nothing will be saved. And that can be and still is life, just fully deprived of all material possessions. It’s still raining outside. 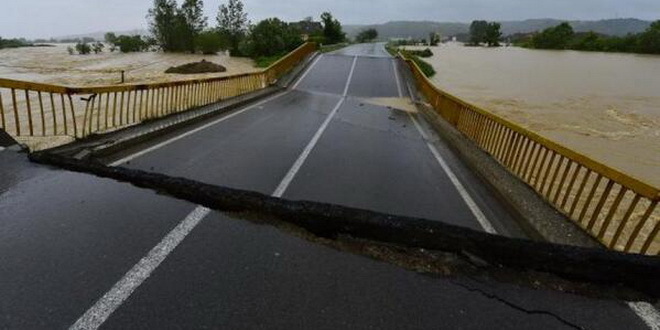 And the level of the Sava is rising, 10 cm every hour in the town of Sabac. People from everywhere are trying to save Sabac with thousands of bags of sand. It’s night and they are working without a pause. I do hope they will make it. I’m no longer indifferent to rain, it started rhyming with pain. Dear God, please stop this rain. Stop the pain. May all those efforts to save lives and property not be in vain. 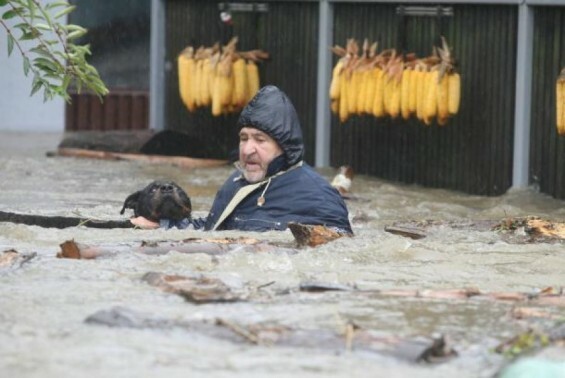 Yes, I heard on the radio about your floods. It is terrible, Thank you for writing this post, I think of you and hope the rain stops. Thank you so much for your kind words, it is terrible indeed. 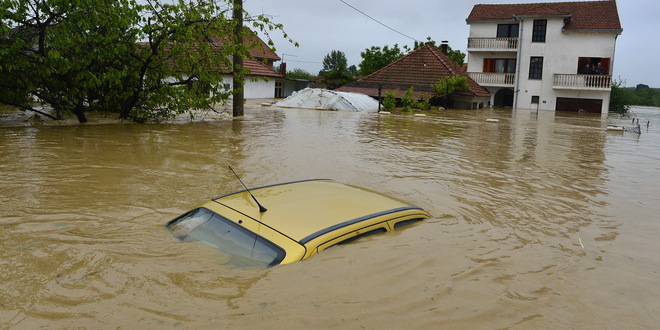 The rain more or less stopped thank God, but so many places are under water or still in danger mainly because of the river Sava, people are truly devastated. 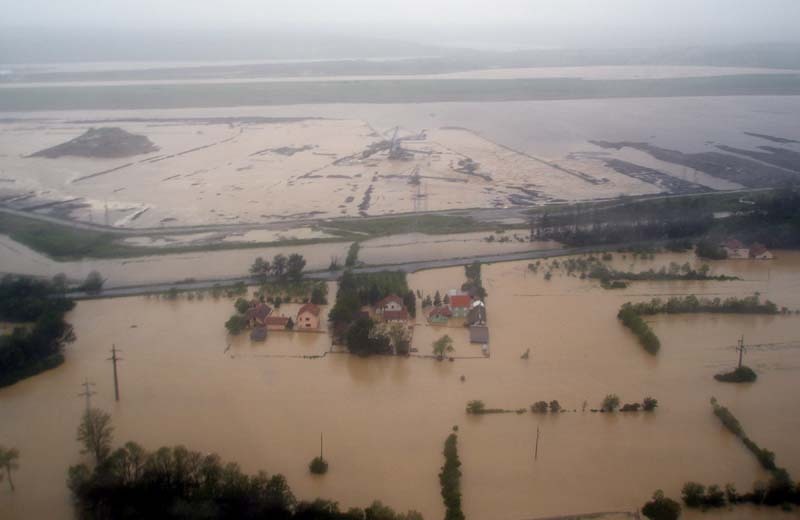 Serbia is now filling bags with sand and soil to save what is still to be saved, more than half million bags have already been placed at the most critical parts. There is nothing more to do other than to help each other the best we can in the following weeks. Take care and thank you again! Happy to hear that the rain stopped. 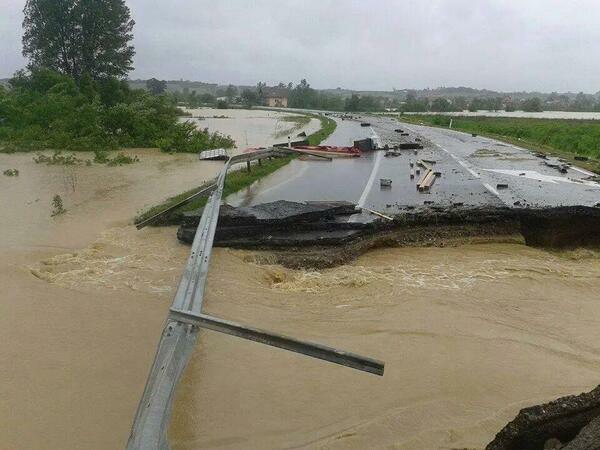 A few years ago, my town had a big flood and many people lost their homes, it is good for people to help each other.